"The past two decades have seen the growth of well-coordinated networks of political activists who have managed to obtain hundreds of millions of taxpayers' dollars for political lobbying. Although federal regulations prohibit such activities, loopholes in the law allow these monies to be masked as private resources. 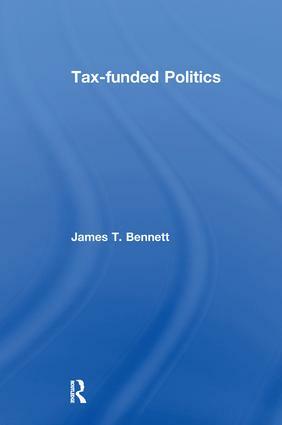 State and federal taxpayers, monies fund the lobbying efforts of private advocacy groups on both the political left and the right.In Tax-Funded Politics, James Bennett argues that governmental agencies, rather than combating theses abuses, aid and abet them in order to increase their own size and scope. Drawing on a broad range of examples, Bennett shows how the ideals of the nation's Founding Fathers have been subverted by molding and manipulating the will of the people through government-orchestrated propaganda. Government agencies, far from being indifferent to self-aggrandizement and the consolidation of wealth and power, are concerned with their own self-interest, whether it is enhancing their budget or supporting a particular political agenda. Likewise, nonprofit entities claim to operate solely in the ""public interest"" but also engage in political advocacy and lobbying activities. But when charities do the lobbying, blatant self-interest is wrapped in the halo of the ""public interest. ""Tax-Funded Politics exposes dozens of mutually beneficial arrangements between government and charities involving hundreds of millions of dollars. It then explores their implications. Groups that receive government funds are loath to criticize failed government programs and are advocates for the expansion of the agencies that provide their support. Even charities learn not to bite the hand that feeds them. Although the vast majority of the funds are directed to nonprofit groups on the left of the political spectrum, so-called conservative organizations have also sought and received taxpayers' funds, despite promise to get g"
Workers (and Teachers) of the World! Apply for Grants!